Visiting the vineyards of France is easier than ever before. Budget flight operators like Ryanair and Easyjet, have opened up huge swathes of regional France, and of course the Channel Tunnel means Paris – and a whole host of onward destinations – are but a hop away. In November 2007 the London Eurostar terminal moves to St Pancras, cutting the journey time, Capital-to-Capital, to just two hours and fifteen minutes. A quick flick through the Michelin Red Guide is all that is needed to show that France offers an extraordinary infrastructure of quality hotels and restaurants to service both domestic and international tourists. The French passion for gastronomy means a Michelin-starred experience is never far away. Yet some of the most famous French wine regions are not so well blessed with first class facilities as other wine routes around the world. In many ways, the rather traditional French have been slow to learn from their neighbours and New World colleagues that wine tourism is big business. There’s a whole world of independent and adventurous gastronauts who are ready, willing and able to visit the vineyards, but with an expectation that quality, modern hotels and excellent dining will be close to hand. Visit California or South Africa and there is an abundance of beautiful, boutique accommodation right in the middle of the vines. Some are actually on wine famous estates, and some in the charming small towns that invariably dot the wine routes. Yet only in the last few years have some of France’s producers begun to wise-up to this new breed of upmarket wine tourism. The latest of those is Michel Laroche of Chablis. Laroche is without doubt one of French wine’s most ambitious and enterprising producers, who over the last decade or so has not only promoted the Laroche Chablis ‘brand’ to the forefront of the region, but who has created estates in the Languedoc, Chile and South Africa. Laroche has run a smart wine bar in the beautiful small town of Chablis for many years, but his newly opened hotel and restaurant brings a wonderful new dimension to this slightly staid corner of Burgundy. 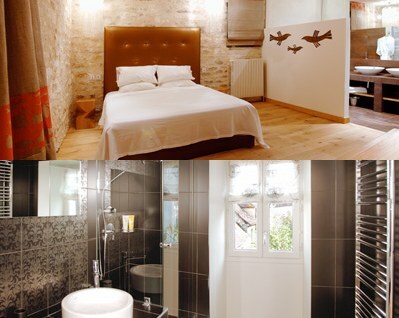 The Hotel du Vieux Moulin is an extraordinary boutique hotel of five rooms and two suites, built within a gorgeous 18th century water mill right in the centre of the town. Michel and his wife Gwénaël have restored the building beautifully, leaving its stonework and oak beams exposed in many areas, but cleverly marrying these to cutting edge, contemporary design. Wi-fi, flat-screen TV, spa bathrooms and air-conditioning are standard, and the spacious rooms are filled with commissioned artwork and furniture. High Season rates run from 120 Euros per night to 255 Euros for a large suite with two bathrooms and terrace. But possibly even more attractive are package deals to include dinner, bed and breakfast for two, plus a wine tasting and tour of the nearby l’Obédiencerie, Laroche’s 9th and 15th century headquarters and barrel cellars, for 250 euros per night. But the stunning restaurant is another irresistible attraction. This is the heart of the old mill, and the river Serein rushes beneath the building, viewed through huge plate glass windows on either side of the dining room, looking out to picture-postcard views of ancient houses and flowering window boxes.Inside, the space has been given a similar treatment to the rooms, with the ancient fabric of the building offset by sleek, modern furniture and lighting, and gleaming glass and silverware. The Laroches have created a casual dining room, but with a kitchen that is serious about its food. Apart from a selection of Champagnes, only Laroche wines are featured, but as those range from inexpensive Chilean Sauvignon Blanc, to Languedoc Syrah, to Grand Cru Chablis, there is plenty of choice. What’s even better, all are offered at shop prices plus 10 Euros (about £7), so drinking those top wines is well within reach. And the food? Well it is excellent and ample: the menu may be contemporary, but portions here acknowledge Burgundian appetites. Start at the bar with a glass of Chablis and some delicious gougères (posh, choux-pastry cheese puffs) before choosing from a short, seasonal menu that changes every fortnight. Highlights of my September visit werecrisp Seabass fillets, pan-fried on the skin side, and served on a heap of braised whole fennel with an interesting vanilla and mocha coffee sauce. A lovely, tender veal steak came with a creamed pea sauce, and the biggest pile of buttery, pan-fried girolle mushrooms that I have ever seen. Puddings are also worth saving room for, and coffee is served with buttery little Madeleine cakes.Food prices are moderate, with three courses costing around 30 – 35 Euros. The town of Chablis also boasts the one-starred, and very good Hostellerie des Clos, a very comfortable restaurant with rooms, but Laroche has created a world class, contemporary venue in this tranquil corner of Burgundy whilst respecting the unique charm and history of the buildings. And the truth is that such vision and commitment is needed throughout France’s wonderful wine regions as we near the end of the first decade of the Millennium.